Could PET/MR imaging become a ubiquitous tool in the diagnostic armamentarium? Will its role ultimately prove to be more specialized? Will this newer hybrid modality relegate PET/CT to the junk drawer of transitional technology? While radiology researchers investigate PET/MRI's clinical role, I'm predicting PET/CT won't be tossed into the same metaphorical drawer as the PalmPilot anytime soon. 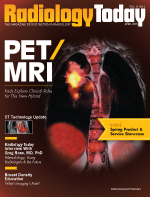 Frequent contributor Beth W. Orenstein writes about PET/MRI's transition from research tool to clinical tool in this issue. "Our efforts are focused on identifying which diseases and which patients are most appropriate for PET/MRI and where we can use it to see early if a treatment is working or not," Andrei Iagaru, MD, tells Orenstein. Iagaru, an associate professor of radiology in Stanford University Medical Center's division of nuclear medicine and molecular imaging, is part of a team looking at both clinical and operational aspects of the technology. "We are also making progress developing efficient workflows for the various indications for the PET/MR," he adds. Early adopters at Stanford and elsewhere are exploring which cancers PET/MRI might provide better information about—to help plan treatments or assess their effectiveness. They hope to learn where the modality might reduce the need for other types of imaging, or how it can reduce overall radiation dose. They're also looking into workflow issues, as well as cost and value justifications—as is the case with almost everything else in health care these days. This issue also contains thoughtful insights about teleradiology and young radiologists from Greg Rose, MD, PhD, CEO of Rays, a teleradiology company. Interestingly, Rose thinks teleradiology is not the best place for young radiologists to begin their careers. His thoughts on what future radiology practices may look like are worth reading as well. Finally, with 21 state laws already on the books as this issue goes to press, and more in the works, breast density notification laws are expanding. Education lags well behind about what both patients and physicians should do with the news that they or their patients have dense breast tissue. In this month's issue we also look at radiologists' role in providing that education and how some breast imagers are doing it in their practices.